My adventure is slowly taking off –just baby steps at the moment. Literally, baby steps. 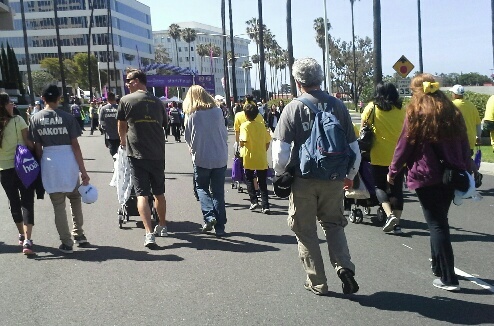 Yesterday and today I participated in March of Dimes’ walks to support the cause but mostly to honor a baby who died before he was born. Other than that, my life seems much as always, though it isn’t, really. I’m staying with friends until I get my car back, then I have to find a place to stay for a month — I certainly don’t want to wear out my welcome, and I need to stick around town for a while to rehearse for a dance performance. The last days at my father’s house were hard — empty rooms and memories — so I’m glad I don’t have to be alone just yet. People are being very kind to me, which is helping make this transition easier. I sometimes wonder if all my talk about adventure is simply that . . . talk, but the idea is becoming very real to me, so I will do something. A friend told me about a woman who walked out of her house after her husband died, and never went back. Never had another permanent home. I understand how that is possible, and it might be the path I take. A woman who moved out of her husband’s house after he died and never had a permanent home again…sounds like the beginning of a novel.